Not to be confused with Mazda Titan. 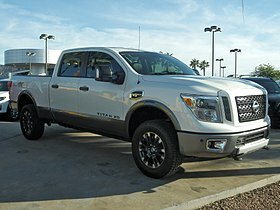 The Nissan Titan is a full-size pickup truck manufactured in the United States for the North American market by Nissan. It was named for the Titans of Greek mythology. Development of the Titan began in September 1999, with design work under Diane Allen. Giovanny Arroba's TA60 exterior was chosen in late 2000, with a final production freeze in July 2001. The design language of the future truck was previewed by the 2001 Alpha T concept shown at the 2001 Detroit Auto Show, which had previously developed through November 2000. Production began on September 21, 2003 and sales on December 1, 2003. The Titan used Nissan's new full-size F-Alpha platform. This new platform was shared with the Nissan Armada and Infiniti QX56 SUVs, with all three manufactured in Canton, Mississippi, United States. The first generation Titan continued without a major redesign through 2015. All models came standard with a 32-valve, 5.6-liter engine, VK56DE, which generates 317 hp (236 kW) (305 hp or 227 kW on 2004–2006 models) and 385 lb⋅ft (522 N⋅m) of torque. The first generation Titan came equipped with a fully boxed ladder frame and was available in either rear-wheel drive or a shift-on-the-fly four-wheel-drive system coupled with a five-speed RE505A automatic transmission. An automatic brake-limited slip (ABLS) system was available on all Titans. The first generation was available as a King Cab (extended cab) or a crew cab with a full-sized back seat, with no regular cab being offered. The King Cab featured a 6-foot-7-inch (2.01 m) bed, while the crew cab had a 5-foot-7-inch (1.70 m) bed. In 2008, a longer wheelbase model was offered with either an 8-foot-3-inch (2.51 m) bed on the King Cab or a 7-foot-3-inch (2.21 m) bed on the crew cab. There were originally four trim levels available: the S, SV, Pro-4x, SE, and LE. The SE and LE trim was eventually replaced by the luxury SL trim. The S was the base model, the SV a mid-level model with more features, the PRO-4X was the off-road-oriented version, and the top level SL was offered with features like 20-inch alloy wheels as standard equipment. The first generation Titan carried a five-star rating from the National Highway Traffic Safety Administration for driver frontal crash, and a four-star rating for passenger frontal crash. The second-generation Titan was to be a lightly reskinned, rebadged version of the Dodge Ram, but those plans fell through with the 2008 worldwide financial crisis. Nissan unveiled the second generation Titan at the 2015 North American International Auto Show. The standard engine is a 5.6-liter V8 gasoline engine. The engine has increased in power compared to the previous model, producing 390 hp (291 kW) and 394 pound-feet (534 N⋅m) of torque mated to a 7-speed automatic. Additionally, the second-generation Titan offers a 310-horsepower (230 kW) Cummins 5.0-liter turbo diesel V8 that produces almost 555 pound-feet (752 N⋅m) of torque. The engine is referred to as the ISV. The second-generation Titan is available in two forms, regular and XD. The XD version is built on a heavy-duty frame based on Nissan's commercial vehicle line and includes the Cummins diesel engine as an option. The platform is shared with the Nissan NV. ^ Witzenburg, Gary (June 9, 2015). "Interview With 2016 Nissan Titan Senior Design Manager Diane Allen". Truck Trend. Retrieved December 3, 2015. ^ "2005 Nissan Titan Specs". Internetautoguide.com. Archived from the original on May 25, 2009. Retrieved December 3, 2015. ^ O'Dell, John (June 15, 2003). "Along for the Ride". The Los Angeles Times. Retrieved December 3, 2015. ^ "Infiniti Goes Big". Just Auto. March 23, 2004. Retrieved December 3, 2015. ^ "Tesla hires top designer Randy Rodriguez, man behind: Nissan 370Z, Titan and ICON A5 aircraft". Electrek. Retrieved 5 September 2016. ^ McGlaun, Shane (January 13, 2015). "Nissan unveils new Titan XD truck in Detroit with V8 Cummins diesel option". SlashGear. Retrieved July 6, 2015. ^ "Cummins 5.0 Turbo V8". Retrieved 21 August 2013. ^ a b "Nissan & Infiniti Dec. 2011". Nissan USA Official Media Newsroom. Retrieved February 7, 2019. ^ a b "Nissan Group reports December 2013 and 2013 calendar year U.S. sales". Nissan USA Official Media Newsroom. Retrieved February 7, 2019. ^ a b "Nissan Group reports December 2015 and 2015 calendar year U.S. sales". Nissan USA Official Media Newsroom. Retrieved February 7, 2019. ^ a b "Nissan Group reports December 2017 and 2017 calendar year U.S. sales". Nissan USA Official Media Newsroom. Retrieved February 7, 2019. ^ "Nissan Group reports December 2018 and 2018 calendar year U.S. sales". Nissan USA Official Media Newsroom. Retrieved February 7, 2019. 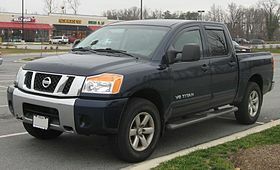 Wikimedia Commons has media related to Nissan Titan.